Alex Macarte ov Manatees and the mighty Gnod reveals his intimate solo work on the 2nd release by new, Manchester-based cassette label, Sacred Tapes. 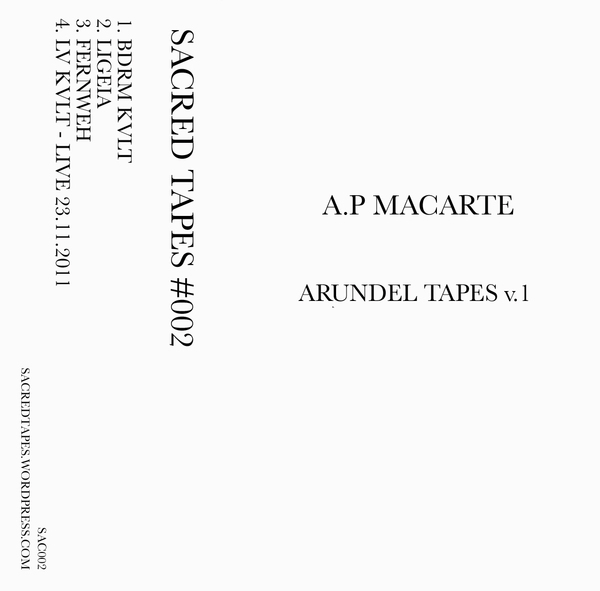 'Arundel Tapes v.1' documents his sequestered home recordings of "slow burning vocal loops and drone manipulations" over four extended pieces scoping deserted internal panoramas of brooding raincloud drone, coruscating half-lit amp worship and midnight devotionals recalling traces of everyone from Loren Connors to Barn Owl, but perhaps at his best, most chilling in the gorgeously Grouper-like vocal metaphysics of 'Fernweh', and at his boldest in the striking feedback wails and ritualist drones and possessed incantations of its longest part, the 18 minute 'Lv Kvlt - Live 23.11.2011'. A real gem, don't miss this.